From virtual reality to makeup infusion, businesses get ready to revolutionize legal weed. In a trendy studio in Toronto's fashion district, shared by several tech start-ups, you can slip on a pair of glasses and be transported to a weed production facility thousands of kilometres away. 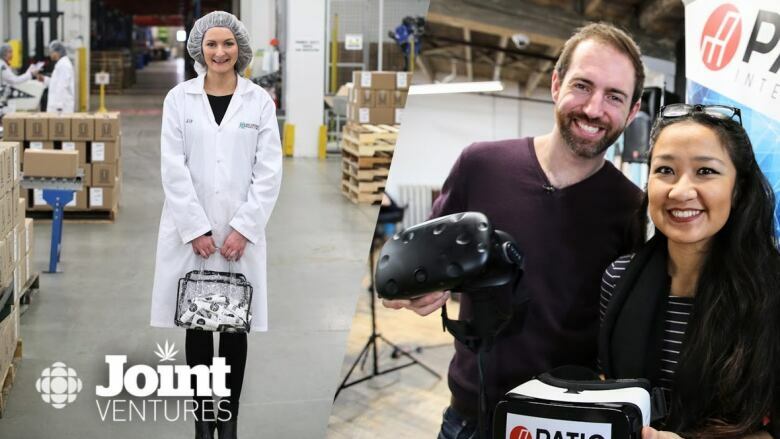 Users of Patio Interactive's virtual reality lens can walk through the building, touch the cannabis buds, and learn all about where their weed comes from. It's just one of many tools that tech firms are using to slice out a piece of the cannabis action as legalization nears. "The boom has already started," Charles Bern, the founder of Patio Interactive, told CBC Toronto. "The levels of innovation, technology, the ripple-effect of the industry has already been felt. Companies have been gearing up." They're getting ready for what industry watchers anticipate will be a multi-billion-dollar bonanza. 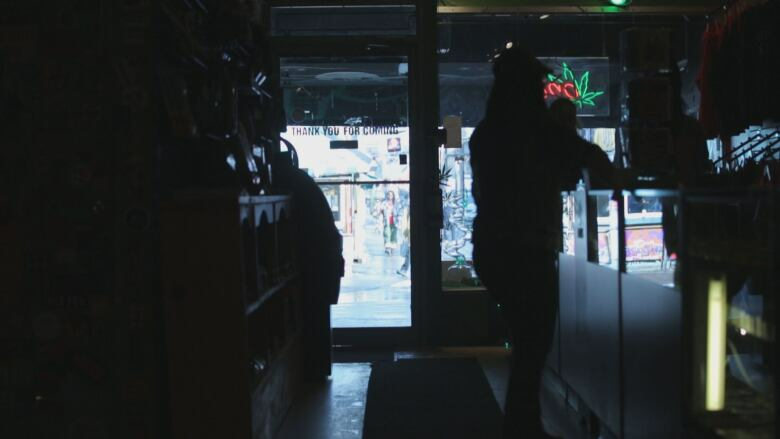 A 2016 Deloitte report estimates that once weed is legalized in Canada, businesses that support the production and distribution of cannabis — referred to as the "ancillary market" — will be valued at approximately $7.8 billion to $13.9 billion. "There is an adventurous, a pioneering spirit. In the same way you can look back at many of the great explorers who found parts of the world otherwise uncharted, we have the same thing in a very different context," said Darren Karusiuk, one of the report's authors. Karusiuk knows what he's talking about. He's now an executive at MedReleaf Corp., a company in Ontario approved by Health Canada to produce and sell cannabis. Meantime, Bern's company, a start-up that focuses on virtual and augmented reality, is looking to push the boundaries of the cannabis experience. "We're working with our cannabis partners to either pair cannabis-related experiences with virtual reality or to create virtual-reality experiences that would mimic it," he explained. Most of the details of that work are "top-secret," Bern says — a necessity to remain competitive in the explosive market. 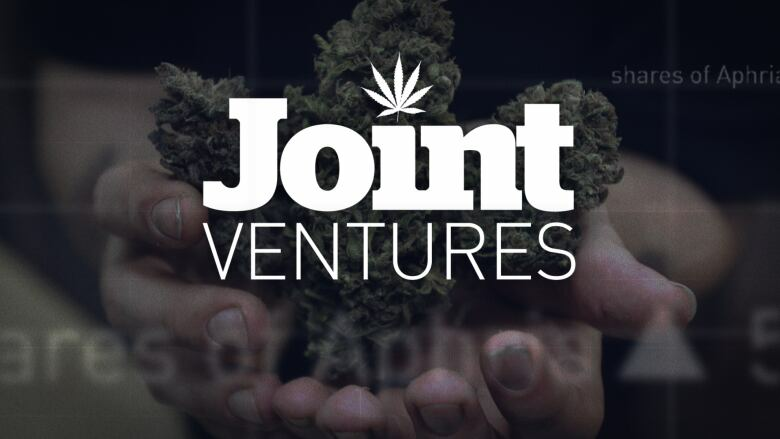 But for now, their foray into the industry centres on creating virtual tours of licensed producers' facilities to shed some light on the how the product blooms. In a landscape where lack of knowledge around the uses and effects of cannabis is evident, tech companies are gobbling up education-focused opportunities. Cannvas MedTech, a start-up based in Vancouver, offers an online-based weed school, news site and strain matcher, all set to launch in March. 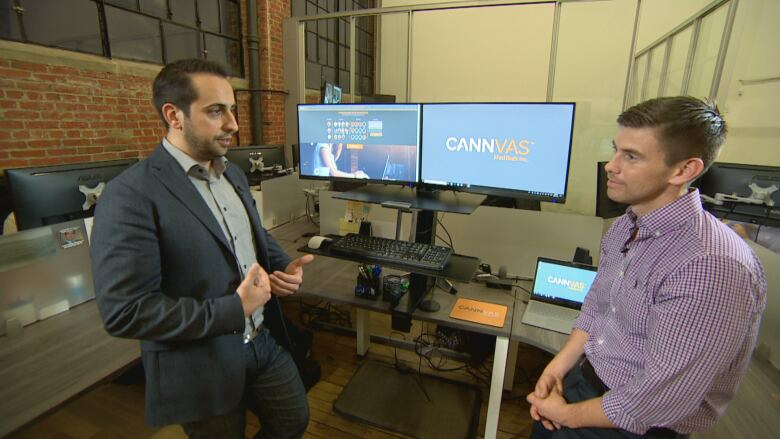 Shawn Moniz shows Chris Glover a demo of his company's strain matcher set to launch in four countries in March (Paul Borkwood/CBC)"You have over a thousand strains out there. How do you know which ones are in patch form or which ones are available in [cannabidiol] oil?" he asked. "Where can I go to actually learn about this?" The site matches someone's characteristics, lifestyle and ailments with a recommended strain, based on data from doctors and users. For instance, a male student suffering from anxiety can find recommended strains to help him feel better, Moniz explains. Once a strain is chosen, the site offers up a list of licensed producers who sell that product. Moniz says the company is completely "agnostic" and will not showcase one producer's weed over another's. They are ready, come recreational legalization, to list the retail spaces where users can buy specific strains. The site can also be used to find a match for recreational use, Moniz said. "It could be relaxation, it could be for an energetic or positive attitude, it could be to relax from insomnia," he explained. One of the biggest challenges, he says, is gathering the data about user preference on a substance that has been in the shadows for so long. But that's something the company Lift Cannabis believes they can leverage. The firm has a news site and organizes what they call Canada's first Cannabis awards but their real cash cow is their data. "We are the largest database of consumer products and of legal cannabis consumers in Canada," CEO Matei Olaru said. The company collects information on "why people are consuming certain products for what use and how long it lasted," he explained. They make that information available to consumers on their website to help with purchase decisions, similar to Cannvas MedTech's strain matcher model. But they also sell it to both private and government stakeholders, "either as market intelligence or for advertising services," Olaru said. Lift Cannabis collects their valuable data through user product reviews. People who share information get points that they can redeem with a licensed producer for discounted weed. Users are not paid based on the content of their reviews, but rather their "comprehensiveness," Olaru said. While businesses like his are getting ready to ramp up their involvement in the ancillary weed market, others are using the plant to disrupt their own industries. "The beauty space is really thirsty for more ingredients and this is a really great way for indie brands to really shake up this space as well," Brandie Leifso, CEO of Evio Cosmetics said in an interview. The makeup entrepreneur plans to mix cannabidiol (CBD), one of the main active ingredients in weed, into her beauty products. "The number one question I get is, 'Will it get me high?'" Leifso said. "The answer is no ... but there are so many benefits to a [CBD-infused] topical product." "It's full of Omega 3, 6 and 9," she said. Leifso has partnered with a cannabis company and has devised a formula for her creams that is ready to be CBD-infused. But because the product is only currently legal for medical use, the beauty product and the cannabis plant are at two different facilities. Come legalization, Leifso says her company will mix and mass produce the products, eventually churning out 23,000 tubes of cream a day.